Greenwich Festival in our back garden! Tonight and tomorrow night only, Crossfields will be invaded by ghouls between 9.40 and 10pm. This is French theatre company Rara Woulib and their show Deblozay – an outdoor promenade performance and part of Greenwich + Docklands International Festival which kicks off today. Local residents will have already heard or seen the rehearsals for Deblozay over the last few nights whilst the company has been camped out at the Creekside Centre. There's been a lot of singing and drums going on till late, and – slightly annoying for those living closest – the all night hum of a generator. Like all the festival events, the show is free, but reservations have now closed. However, Crossfields peeps will be able to watch the performance as it processes across the Ha'Penny Hatch into the estate from an unadvertised meeting point in Greenwich central (starts at 9.10pm). "Haitian culture looks at death in a very different way to our own. It is not a hushed-up affair of cofﬁns and closed doors but a loud celebration of all that life has to offer, in this world and the next. 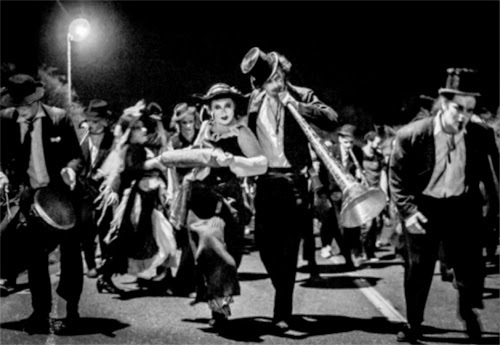 As the sun sets, join French company Rara Woulib in conjuring the ghosts of the city’s departed for this joyous pilgrimage. See for yourself why the dead have so much more fun than the living." Greenwich + Docklands International Festival runs 20 - 28 June. Check out the festival website for other events this weekend and next. For one night only (tonight), there's Muaré by Spanish/Argentinian company Voala, at the Old Naval College, featuring aerial choreography, pyrotechnics and live music (starts 10pm). Greenwich Fair starts today and is on all weekend with three days of free outdoor theatre, circus, dance, installations and sideshows, from lunchtime to 10.25pm Fri/Sat and till 7pm on Sunday, in the grounds of the Old Royal Naval College and Cutty Sark Gardens. With lots more on in between, the festival finale is, as usual, at Woolwich on 28th June. This year it's Polish theatre company Teatr Osmega Dnia with Arka – with 'strong physical performances, Balkan music and fire effects' in a performance which tells the story of a wedding party broken up by military invasion and commemorates the 100th anniversary of the assassination of Franz Ferdinand in 1914 which led to the First World War. 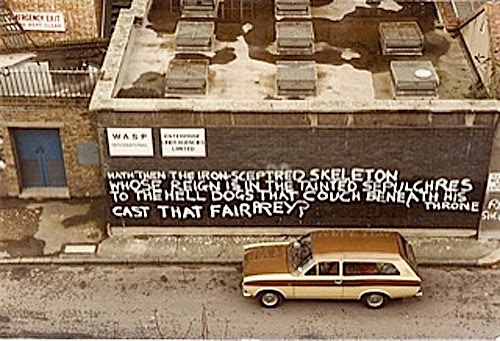 A rather cerebral style of graffiti used to dominate the walls of Creekside in the 1970s and 80s. Most of it has gone now of course. The above quote from a poem by Shelley was scrawled by one Mr Peter Flack, a Crossfields resident in the second half of the 70s. Pete has recently died at the age of 67. He was living in Scotland, and his funeral was held in Aberdeen. But on June 30th at midday, Pete's friends will be gathering at the Cutty Sark pub in Greenwich. At 2pm (or later - see comment below) a small group will board a PLA river launch at Greenwich Pier and ride back to the Cutty Sark to scatter Pete's ashes in the middle of the Thames. 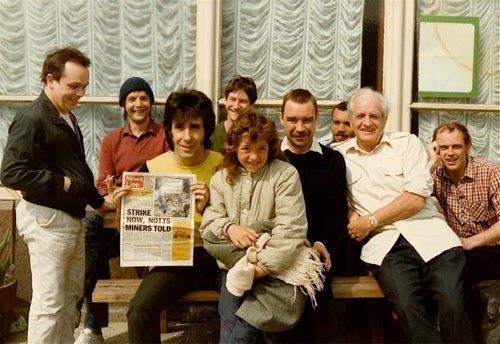 If you knew Pete but lost contact with him and other chums, you're most welcome to come and join in the send-off. Finally there's a new pub on Deptford High Street! Antic opens The Job Centre this evening (5pm-1am). Expect a range of good beers and a 'Spanish influenced' wine menu among the refreshments on offer. Apparently the kitchen will open soon with 'snacking plates and hearty main dishes'. And there'll be 'diverse weekly live music and events'. Until today, there was only one pub left open on the high street, the Vietnamese-owned White Swan, previously a big old Irish bar. The last pub to close on Deptford High Street was the Deptford Arms in May 2010, which like so many other pubs, became a betting shop. The new bar opening is undoubtedly good news for those locals who can afford a night out, but there does seem to be some unfortunate rewriting of history in Antic's publicity. They claim to have taken the pub name "from the employment agency that occupied Deptford in the late 70s". Perhaps they feel the need to distance themselves from an unpleasant reality. Deptford Job Centre actually closed far more recently – in November 2010 – as many long-term or sometime unemployed locals will painfully recall. Not only have they had to schlep all the way over to Catford to sign on since the job centre closed, they also won't be able to afford to drink in the new pub. 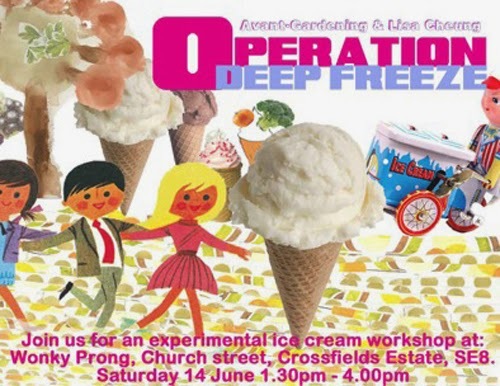 Volunteers at Crossfields gardening project The Wonky Prong are teaming up with Avant Gardening to bring uniquely flavoured ice cream to the estate. cream maker is pedalled to various gardens, to take flavours from the garden and make interesting ice creams. They recently piloted this fun workshop at the old Tidemill School with Assembly. Read more at operationdeepfreeze.com.